Hundreds of mourners have attended the funeral in Bristol of six-year-old Liam Hogan, who died while on a family holiday in Crete. 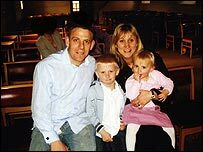 Liam was killed when his father, John, 32, fell with him and his younger sister Mia from a fourth floor balcony. His body was carried in a white coffin covered in white roses and sunflowers. A dalek made from sunflowers was also placed by the Dr Who fan's side. Mr Hogan is currently under police guard in hospital in Heraklion, Crete. The funeral was held at the Holy Trinity Church, close to the family home in Bradley Stoke, near Bristol. 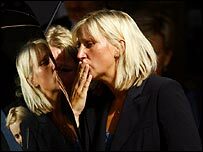 Liam's mother Natasha, 34, a nurse at the Royal Gwent Hospital in Newport, kissed her hand before placing it on Liam's coffin as it lay in the back of the hearse. As the hearse drove off, Mrs Hogan broke down in tears and was comforted by close family members in the back of the car. The 40-minute service was attended by 300 mourners, many of them children, who sang a song Liam learnt at the church holiday club - the Pyramid Rock holiday song. Dozens of photographers, TV camera crews and reporters watched as the family attended the private service, which was then followed by a cremation at South Bristol Crematorium. Mrs Hogan had earlier paid tribute to him, saying: "I will always remember Liam as a happy little chap." She said "he loved, and was loved by all of his family". Mrs Hogan went on to say: "Liam was a young boy gaining confidence everyday with a bright happy character. "As a young boy he was obsessed with Thomas the Tank Engine, but this had since been replaced by Harry Potter, Star Wars and in particular Dr Who. This I noticed was a sign of him growing up. "He was an active boy who particularly enjoyed swimming. I was very proud when he recently passed his 200m swimming badge. He was determined to get his 400m badge by Christmas which he would have achieved." She added that Liam was "very close to his sister Mia" and that she would "miss her big brother". The Rev George Nuttall, one of two ministers conducting today's service, said the family called Liam "our little fish". Mr Nuttall added: "On holiday in Crete before this tragedy happened, Liam was to be found in the water park at the hotel. "He attended the hotel holiday club and enjoyed fun-filled days, choosing his own food and making sure he got to the ice cream. "At home he loved to be out in the garden, especially when his friends were able to come round or when his father, John, lit the barbecue," he said. The Foreign Office said Mr Hogan will be arrested on suspicion of the murder of his son and attempted murder of his daughter when he is fully recovered. The businessman suffered a broken arm and leg and chest injuries in the fall on 15 August. His two-year-old daughter Mia also broke her arm. Mr Nuttall added that Mr Hogan had been "an excellent dad" and had a close relationship with his children. An inquest into Liam's death has been opened and adjourned at Flax Bourton Coroners' Court "pending further inquiries" by police in Crete.